A sweet creamy chocolate dream rolled to please. 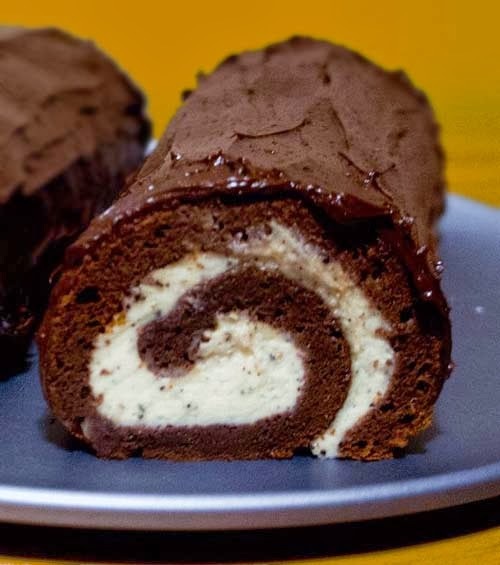 Recipe and instructions are from http://www.kraftrecipes.com/recipes/chocolate-cake-roll-114589.aspx. It is just a video and below is an attempted transcription. But you really should see the video at least once. Preheat oven to 350 deg F. Prepare a 15x10x1 pan with non-stick spray, a layer of wax paper, and another application of non-stick spray over the wax paper. In a bowl, melt 3 squares of Bakers chocolate with butter and combine. Add granulated sugar and blend well until lumps are gone. With an electric mixer (i.e. Proctor Silex 5 Speed Hand Mixer) on high setting, beat eggs in a large bowl. Add chocolate mix until continue to blend until well blended. Add 1/4 cup flour and baking soda, blend well. Add remaining flour, 1/4 cup at a time, along with water, 1/3 cup at a time, and blend thoroughly in between. Alternate until flour and water are used up. Spread the resulting cake batter on pan and bake at 350 degrees F and bake for 15 minutes. After removing the cake from the oven and while still hot, sprinkle 1/4 cup powdered sugar across the surface of the cake. Cover pan and cake with a towel, hold edges tightly and invert pan carefully. Cake should easily pop out. Peel off wax paper. Gently roll the cake with the towel and allow to cool. While cake is cooling, make the cream filling by mixing cream cheese and 1/2 cup powdered sugar with electric mixer until well blended. Then fold in 1 1/2 cup of Cool Whip. When cake is cool, unroll it gently. Spread a layer of creamy filling on top. Roll cake over the filling back into its rolled position. Adjust cake with seam side down on a platter. Make the chocolate frosting by melting 3 squares Bakers' chocolate and 1/2 cup Cool Whip in a bowl. Mix well and cover the outside of rolled cake.